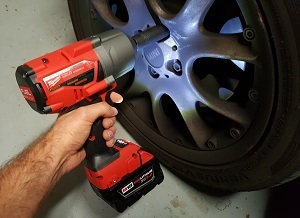 There is rarely any tool we love more than a great impact wrench. As such, we were quick to jump at the chance when Milwaukee offered to let us try out their M18 Fuel High Torque 1/2″ Impact Wrench (specifically Part Number 2767-22). Shortly after it arrived, we realized that we had an extremely well timed tire rotation project planned which gave us the perfect opportunity to take it for a spin (get it?). 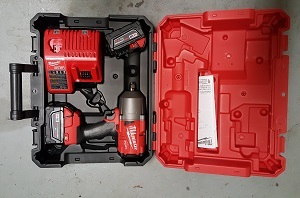 When we unboxed the M18, the first thing we noticed was the bright red molded case, which housed the impact wrench, a pair of 18V lithium batteries, and a charger. The case is made with relatively thick plastic which made it feel quite robust, and the latches were sturdy to match. The handle was plastic but lacked any discernible play so we would expect no issues there. So, it has a great case…check! After making sure the batteries were charged on the easy to use charger, we headed to the garage to start our project. Once there, the first thing we did was throw a 17mm impact socket on the anvil, which allowed us to test out the friction ring. The friction ring worked about the same as a standard ball detent mechanism once we got used to it. The first pass took a little more force than we were expecting to get the socket on, but after one or two more times we had it down. The friction ring mechanism didn’t strike us as particularly revolutionary per se, but it was functional and did the job so we weren’t worried about it. As we clicked the battery in, the light weight of the wrench became obvious. Due to the compact size, the M18 Fuel clocks in at just a tick under 6 pounds for the wrench/battery assembly. While we didn’t use it for an extended period of time, the weight advantage was significant enough over many of the competitive wrenches that it would have an obvious positive impact on reducing user fatigue during long projects. Holding the wrench in hand as we lined it up to unzip the first lug bolt, the focus quickly shifted to the stellar ergonomics. Compared to the clunky pistol grip ergonomics of many of the budget impact wrenches out there, the contoured handle with rubber grip surface felt sublime. The rubber was high durometer (aka hard) and non-porous, which is exactly what you want when working in wet and oily environments as it makes the tool easy to clean when you are done so it is nice and fresh for when you use it next. Upon pulling the trigger for the first time, we were greeted with a relatively muffled whirring sound, which was a welcome surprise considering how loud some impact wrenches can be. We were even more excited when the LED light came on as we pulled the trigger to illuminate the area around the socket. As we were doing our project in the evening, our garage was more dimly lit than it would have been in the day, and the LED actually made a pretty huge difference. Also, suffice to say that the 1400 ft-lbs of twist in the counter clockwise direction made quick work of our lug bolts, which were torqued to 85 ft-lbs last time we installed the wheels. On the next few lug bolts, we opted to play around with some of the drive control modes, which allow you to cap your max RPM (revolutions per minute) and IPM (impacts per minute). We quickly settled on the fourth mode denoted by a circular arrow on the indicator, which is arguably the most interesting due to the immediate reduction in RPM once your bolt breaks loose and starts to spin. This was particularly useful when removing the last lug bolt on each wheel as it allowed us to control the RPM so that we didn’t accidently back the lug bolt all the way out, which allowed us to make the last few turns using a ratchet so the wheel didn’t fall until we had some hands on it. After finishing the project, we are pleased to report that our tire rotation with the M18 Fuel High Torque went great! While we weren’t able to use the impact wrench for long enough to drain the battery life completely, lithium batteries in general tend to have great battery life and the M18 batteries were no exception. After the project, which consisted of removal and reinstallation of 16 lug bolts (we should note that we walked the bolts most of the way back in with the impact wrench but performed final torque to spec with a torque wrench) , the indicator on the battery still showed as full with no notable degradation of torque output from the wrench. Needless to say, with the pair of batteries fully charged, we’d expect that they’d last you the better part of a busy day in the shop. Overall, the Milwaukee M18 Fuel High Torque Impact Wrench was absolutely fantastic! We were very happy with the way that the wrench handled as well as the way it delivered torque to our fasteners. Another final note worth mentioning is that Milwaukee offers a 5 year warranty on the wrench, which is not only an obvious vote of confidence in the product from the company, but also a nice-to-have for the peace of mind that your tool investment will be protected. As far as where to buy, we suggest checking out Milwaukee’s website to find an authorized dealer, as this will ensure your warranty is preserved. We think that you will be extremely happy with the M18 Fuel and can confidently give it a strong recommendation from a value standpoint. If you are looking for more impact wrench info in general, have a look at our impact wrench information page by clicking here. Happy wrenching!